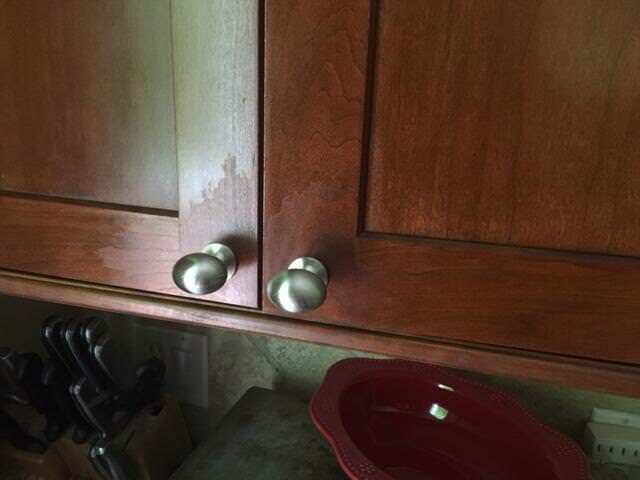 I bought the shown below Kitchen Cabinets from HD about 7 years ago and it looks like the top coating is starting to peel off. The peel looks like the breaking of dried skin after a sun burn. I am not sure if the coating is clear Polyurethane or lacquer or anything else. Can you please let me know how can I fix the peeling. Any tips regarding specific actions and products needed are appreciated. 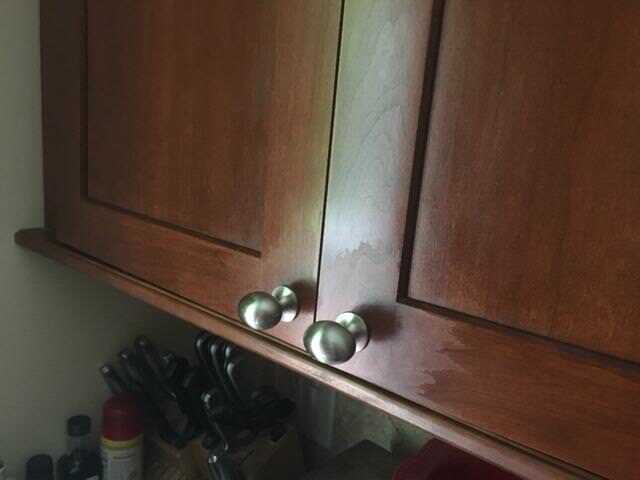 As opposed to pealing, it appears to be normal wear and tear since it's around the knobs where the doors are grasped to open them. This can be easily be refinished with polyurethane. Remove the knobs, lightly sand the areas with 220 grit sand paper, feather the edges into the remaining good finish. Mask off the the unaffected area leaving about 2-3 inches to blend in the new finish with the old. Using spray polyurethane apply several very light coats to the damaged area, being careful to blend the old finish with the new. If the new finish is uneven or too shiny use 0000 steel wool to smooth out the new finish. Make sure you have the same sheen level as the rest of the door, satin is the most commonly used sheen on cabinets. If you feel you cannot handle this task your self, our Home Service Division can refinish your cabinets for you. Contact your local Home Depot for more information. Thanks so much for your advice Mike. Can I use a brush for the poly or is there any significance to using a spray?